Instruments in the WiscAr lab allow us considerable flexibility in how we obtain isotopic compositions, and thus determine the age, of various types of samples. Laser incremental heating of volcanic groundmass samples. Before any of these types of analysis are undertaken, the purified sample must be irradiated in the fast neutron flux of a nuclear reactor. The length of time needed to irradiate a sample is proportional to its age. This is because we are converting some of the 39K into 39Ar as a proxy for the parent isotope of 40K, and it is desirable to generate a 40Ar/39Ar ratio in the sample as close to unity as possible. The method works because the ratio of 39K to 40K is constant in the earth, so measuring 39Ar in turn gives us 40K. We use the research reactor at Oregon State University. Laser fusion analysis is typically used to date pyroclastic rocks such as ash fall or flow deposits. By fusing tens of crystals one at a time, one can test for whether the rock is free from inherited crystals. Both the MAP 215-50 and Noblesse analytical systems are outfitted with fully automated CO2 lasers that emit energy with a 10.6 micron (infrared) wavelength. This laser energy is focused through a ZnS (sphalerite) viewport into a sample chamber and vibrates bonds in crystal lattices and thus heats geological materials, releasing argon gas. As many as 150 single crystals can be loaded into the vacuum system on a copper planchet in the sample chamber. Each system can be programmed to automatically analyze these crystals. On the MAP system, a 25 Watt CO2 laser is capable of focusing to spots between 10 and 400 microns in diameter. Using a beam focused to 10 microns in diameter, sanidine or other minerals may be fused in a single heating step to release all the argon in less than 30 seconds. Following an additional period of several minutes to clean the gas on getter pumps that sorb H2O, crack hydrocarbons and leave a mostly pure noble gas mixture, the gas is expanded into the spectrometer and the isotopic composition of argon measured by peak scanning for about 14 minutes. Each individual laser fusion analysis takes about 25 minutes, when one allows for pumping the system prior to fusing the next sample. The MAP system is used for dating samples that are older than Pliocene or Miocene in age, depending on the potassium content of the minerals of interest. It is common to undertake 10 or more individual laser fusion measurements of single crystals separated from pyroclastic rocks such as ash fall or welded tuff samples. Results of laser fusion analysis of 41 individual sanidine crystals from a Cretaceous bentonite in the Conlinoceros tarrantense ammonite biozone of the western interior basin, USA. These analyses were done using the MAP system and give a weighted mean age of 96.21 ± 0.16 Ma (better than 2 per mil precision at the 95% confidence level). The Noblesse system features a 60 Watt CO2 laser that can be focused to beam sizes between 500 and 4000 microns in diameter. This system is used to fuse sanidine crystals from Quaternary samples, or small crystals in older samples. Results of laser fusion analysis of 17 individual sanidine crystals (150-250 microns in diameter) from the V4 tephra in the Montalbano Jonico marine succession, Italy (Petrosino et al., in press). 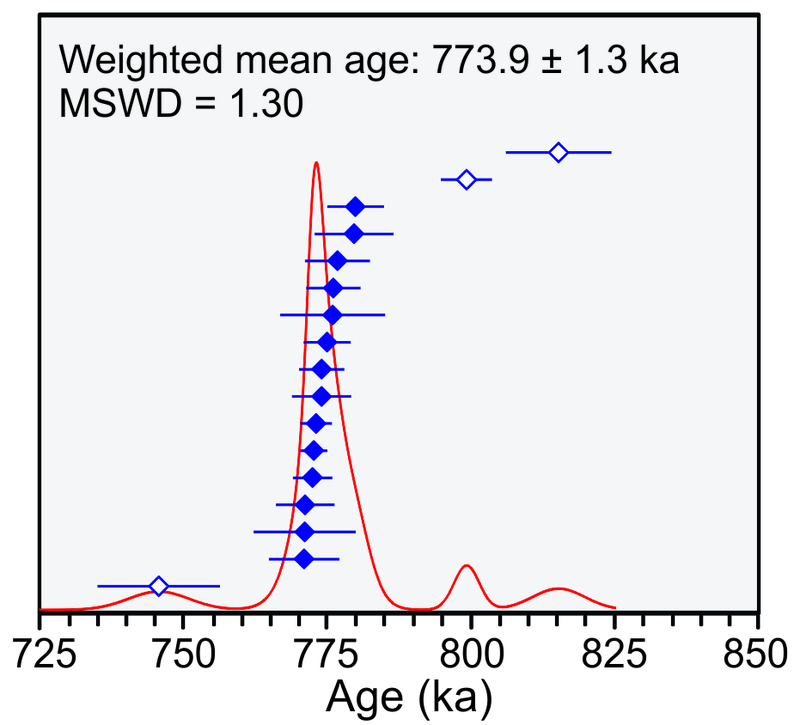 These analyses were done using the Noblesse system and give a weighted mean age of 773.9 ± 1.3 ka (better than 2 per mil precision at the 95% confidence level). Incremental heating analysis is used widely to date volcanic rocks and minerals from plutonic or metamorphic rocks because the age spectrum can help reveal whether or not the sample is altered or affected by thermal disturbances. Incremental heating is accomplished by heating the sample in a series of successive steps, each using a higher laser power than the preceding step. The initial step heats the sample to a temperature of about 600 oC; subsequent steps increase the power equivalent to increasing the temperature by between 50 and 100 oC until the sample is fused to glass in the final step at about 1300 oC. As with laser fusion analysis, the gas generated during each 30 second heating with the laser is then scrubbed free of reactive molecules on getter pumps before admission to the mass spectrometer. The shape of the resulting age spectrum may help distinguish whether a sample has been altered or thermally disturbed after formation. The MAP system is used to incrementally heat sanidine, amphibole, biotite, or plagioclase crystals of Miocene age or older. These can be from igneous, metamorphic, or sedimentary rocks. 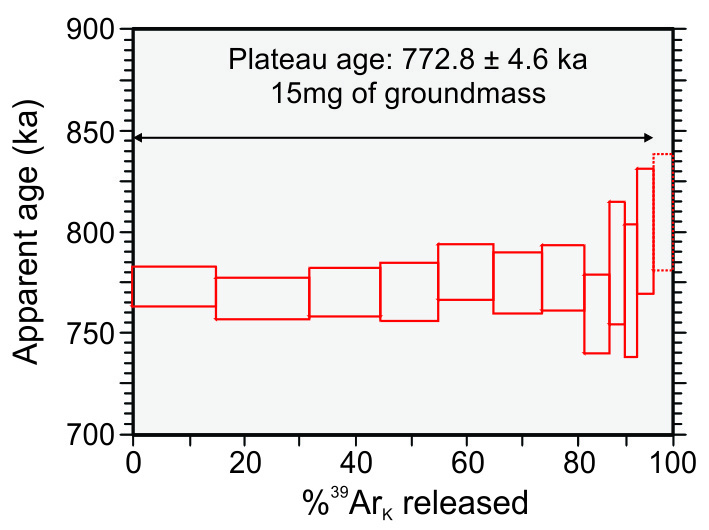 Age spectrum diagram showing results of incremental heating experiment on 5 mg of groundmass from La Angostura basalt, Salamanca Formation, Argentina (Clyde et al., 2014). 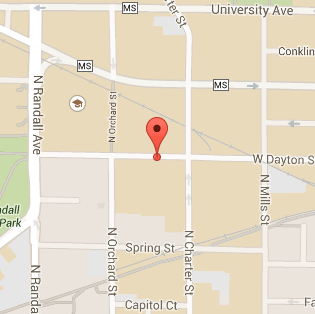 This analysis was done using the MAP system and gives a weighted mean age of 66.95 ± 0.37 Ma. The sensitivity of the Noblesse system allows for incremental heating of Quaternary samples of sanidine, biotite, or volcanic groundmass. It is also possible to incrementally heat exceptionally small crystals of sanidine, 100 microns long or about 0.1 milligram each from Paleogene or older samples. When analyzing Pleistocene to Holocene groundmass separated from lava flows, about 10-15 milligrams of separate are placed into a 5 millimeter diameter well cut into the copper planchet. The laser beam is defocused to a 4 millimeter diameter in order to evenly heat the entire sample during each step of the analysis. 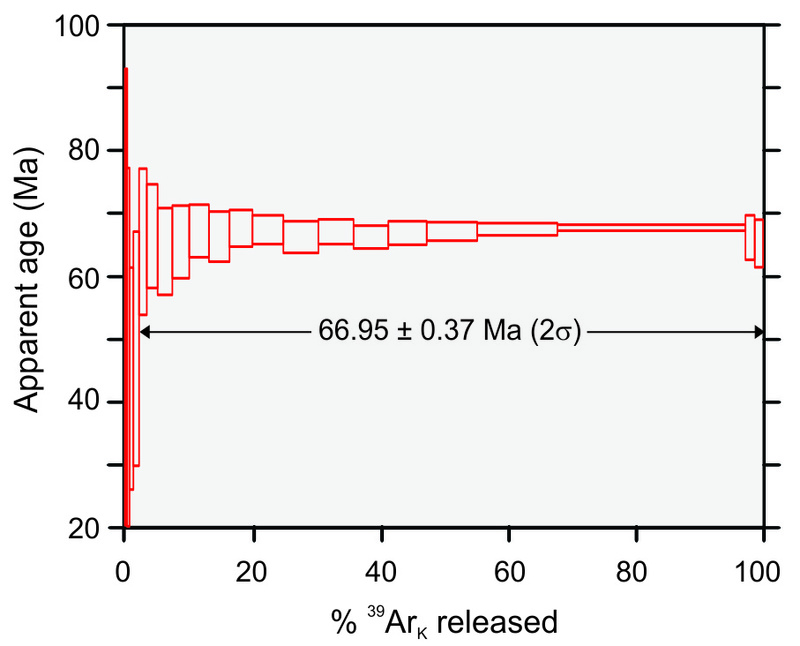 Age spectrum diagram illustrating results of a Noblesse incremental-heating experiment on a single sanidine phenocryst from the Huckleberry Ridge tuff member B, in the Yellowstone Plateau Volcanic Field (Singer et al., 2014, EPSL). The 8 gas steps each give an apparent age that is indistinguishable from the other steps. 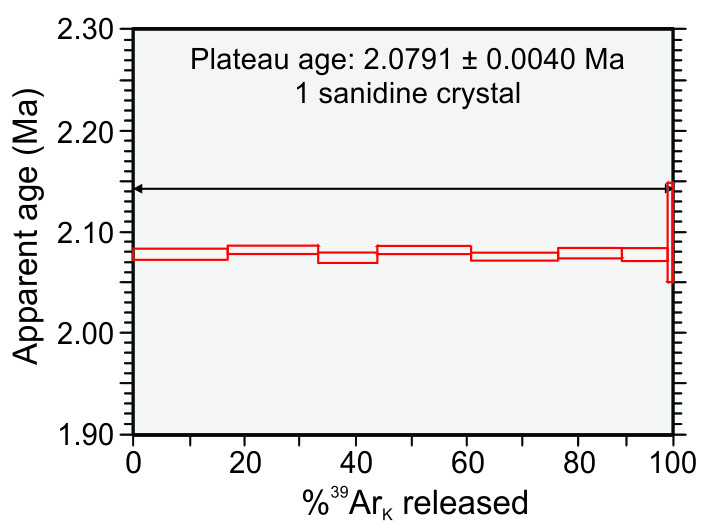 This is called a ‘concordant’ age spectrum with no evidence for argon loss or inheritence; the weighted mean of the 8 analyses gives a date of 2079 ± 4 ka (2 per mil precision at the 95% confidence level) for this crystal. Cobining this date with thos obtained in 12 other similar experiments gives an age of 2077 ± 1 ka (0.5 permil; see Singer et al., 2014, EPSL). Uncertainties are ± 2σ. Age spectrum diagram illustrating results of a Noblesse incremental-heating experiment on a 15 mg sample of groundmass from a lava at Haleakala Caldera, Maui that records the Matuyama-Brunhes geomagnetic polarity reversal (Coe et al., 2004, EPSL; Singer, 2014, Quaternary Geochronology). Eleven of the 12 gas steps each give an apparent age that is indistinguishable from the other steps, with the highest temperature step giving a slighty older age-possibly due to minor inheritence in refractory minerals such as clinpyroxene. This 11 plateau steps give a weighted mean date of 773 ± 5 ka (6 per mil precision at the 95% confidence level) for this lava flow. 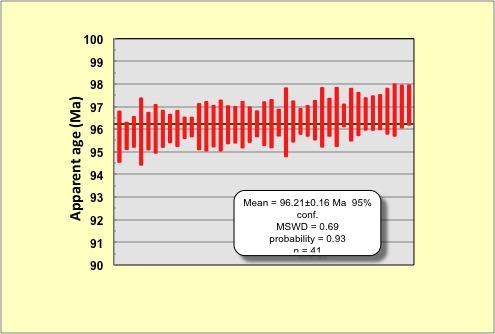 When combined with several other similar experiments on this sample, the uncertainty on the final date is reduced to 1-2 per mil. Uncertainties are ± 2σ. 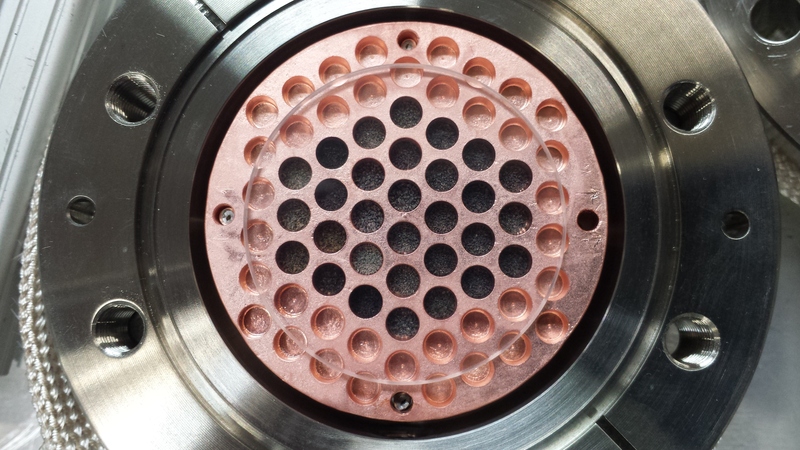 The 60 mm diameter copper sample holder has several 5 mm diameter wells into each of which is loaded about 15 mg of andesite groundmass for laser incremental heating using the Noblesse system. The clear disk on the sample holder is a cover slip made of KBr to protect the ZnS viewport (not installed) from damage by vapor or molten particles generated by heating the samples.